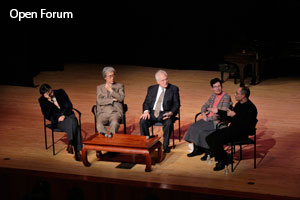 The New York and Washington DC chapters of Music From Japan’s 40th Anniversary were celebrated with unique cross-cultural exchange between the US, Japan, and its neighboring nations: China and Korea. 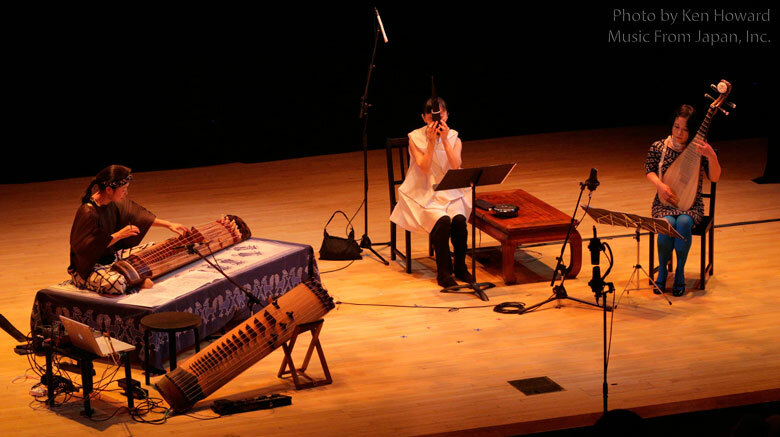 On February 7th, for East Asian Vibrancy, three world class performers of East Asian traditional instruments performed contemporary and classical repertoire. The program was dedicated to Beate Sirota Gordon, who, as the Director of the Performing Arts at both the Asia Society and the Japan Society, helped Music From Japan organize its first events. Geoffrey Gordon, Beate’s son, was in attendance. On February 8th, Highlights of Music From Japan Commissions III featured highlights of past Music From Japan commissions presented alongside the world premieres of two new pieces by Japanese composers. The festival began with a lecture called Exploring the Music of East Asia by scholar and shakuhachi player Ralph Samuelson on the music of East Asia and the connections between the instruments found throughout the entire Asian continent. He explained how instruments traveled along the Silk Road, which became an important travel route for ideas and culture as well as goods. He also pointed out an important event when, in 749, for the dedication of the temple of Todai-ji, musicians from all over Asia traveled to Japan to perform. The instruments they brought with them would then be adopted, slightly modified, renamed, and become the basis of the ensemble for gagaku, the imperial court music of Japan. Sonically, Mr. Samuelson explained, tone color plays an extremely important role in the music of Eastern Asia—more so than in western music. 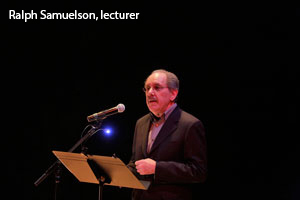 He also explained that in Eastern Asian music there traditionally is no clear separation between composer and performer. Instrumentalists play the role of both composer and interpreter, and typically the tradition of committing music to writing at all only served as a memory aid rather than some kind of definitive manuscript. After the lecture and a short break, Rachel Cooper, the Director of Performing Arts at the Asia Society, took the stage and commented on the power of music and culture in general to facilitate understanding and diplomacy between nations— certainly not a farfetched claim, especially considering the full house included many dignitaries, including UN Ambassadors from Papua New Guinea, Korea, Cambodia, and Japan. 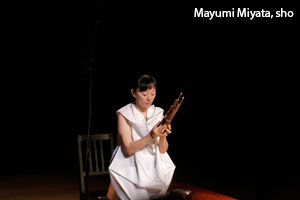 Mayumi Miyata opened the concert with the piece Hyojo no choshi, a traditional piece for sho, one of the wind instruments used in gagaku. The piece is traditionally played as a prelude, and conjures up a particular mood or color in the audience’s mind. Before beginning, Mayumi dedicated the performance to Music From Japan. The piece itself featured long sustained overlapping tones, the pitches sometimes creating harmonic beats—a kind of wavering effect caused by the closeness of the intervals. 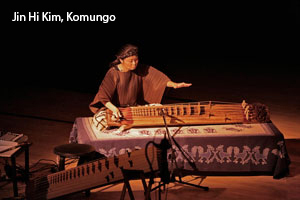 Next, Jin Hi Kim performed Dasrum, also a kind of prelude for another ancient East Asian musical form, in this case kagok, a type of Korean vocal music. The piece was slow and meditative, often with significant space left between each gesture. Wu Man then took the stage, wielding her pipa and first performing Xi Yang Xiao Gu (Flute and Drum Music at Sunset). She graced the audience with a flurry of fast tremolo, overset by beautiful melodic lines. 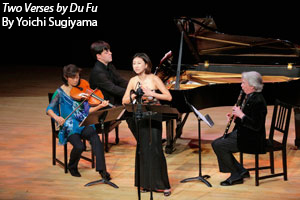 To begin the contemporary portion of the program Wu Man performed two of her original pieces. Night Thoughts was slow and melancholic, featuring lilting augmented seconds and chromatic passages punctuated by silence. Leaves Flying in Autumn lay at the opposite pole, featuring furious tremolo and fast virtuosic lines. Mayumi Miyata returned to the stage, this time performing Yumi Saiki’s piece Entomophonie VII, which was inspired by insect sounds. Indeed, the performance at times was reminiscent of sounds of the forest: long tones were punctuated by quick chirps and punchy dissonant chords. Jin Hi Kim then performed on her electric komungo, a modified version of the instrument, manipulated by computer electronics. She immersed the audience in a soundscape of lush textures as she used a variety of extended techniques, including using a bow on the instrument, which is traditionally plucked. After intermission the three musicians came together in an extended improvisation. The three women spontaneously created some exciting music that was at times sparse and with a fluid sense of time, at other moments dense and upbeat. Finally, the three performed Unkai the MFJ-commissioned piece by Ned Rothenberg. The piece artfully orchestrated this unique configuration, employing seamlessly both traditional and contemporary instrumental techniques. The ancient spirits of the instruments were evoked, but at the same time the sonic palettes of each were expanded into new realms, both individually and as an ensemble. In total, the evening was a wonderful blend of instruments, styles, and techniques. 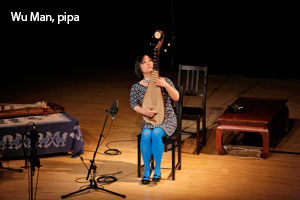 No one could have achieved this better than Mayumi Miyata, Jin Hi Kim, and Wu Man, each known in their own right for expanding the repertoire and pushing the boundaries of these three traditional instruments. 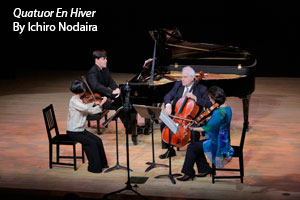 The second day, Highlights of Music From Japan Commissions III, began with Quatuor En Hiver, a piece by Ichiro Nodaira. 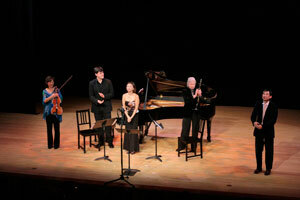 The piece featured Stephen Gosling on piano, Fred Sherry on cello, Ah Ling Neu on viola, and Eriko Sato on violin. Musically, the piece vacillated between punchy and percussive fragments and longer sustained gestures. It seemed Mr. Nodaira was often treating the ensemble—especially the trio of strings—as a single instrument, with lines, specific pitches and gestures bouncing between the violin, viola, and cello freely. 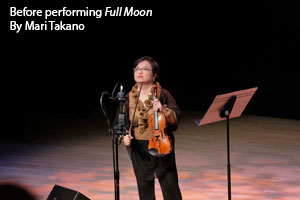 Next, Mari Kimura expertly performed Mari Takano’s Full Moon, a piece for violin and electronics. The accompaniment, played from Kimura’s laptop, spanned the gamut between purely synthetic sounds and violin samples. The piece was energetic, dense, and polystylistic, showing off a wide range of timbres and techniques on the violin. 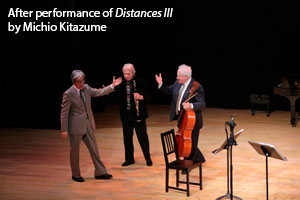 Distances III by Michio Kitazume, performed by Fred Sherry and Richard Stoltzman, was reductive and even elemental, using as its elements deconstructed phrases, tones, and sounds. The composer employed silence, trills, and glissandi to make for a brilliant dialogue between these two performers, who were facing each other seated close together on stage. 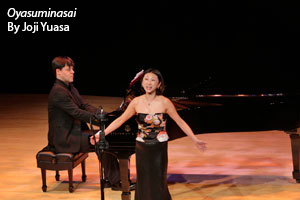 Oyasuminasai, a piece by Joji Yuasa and performed by Stephen Gosling on piano and Wonjung Kim on voice, was a break in an otherwise highly abstract program of music. Yuasa’s use of the piano and voice was relatively idiomatic, employing lush romantic harmonies in the piano and beautiful melodic lines for the soprano. Two Verses by Du Fu for voice and instruments by Yoichi Sugiyama was composed in such a way that allowed the performers some flexibility in the unfolding of the piece. Rather than following a definitive pulse followed by all of the musicians at the same time, each performer proceeded independently from the others, working with durations that lacked a pulse. As such, the piece seemed improvisatory at times. Stylistically, the first movement was atonal and melancholic and the second movement employed a kind of busy dense texture among the instruments that would pause each time Wonjung entered with her voice. 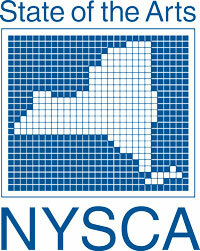 The New York chapter of the festival was concluded by two open forums. The first was a conversation between Sharon Nakazato and Kotoko Fukunaka in which Ms. Fukunaka, who wrote a book on Music From Japan, discussed its historic importance. In particular, she placed an emphasis on the large scale projects that MFJ organized and took part in, such as the composer portraits and their collaboration with the New York City Opera on Kinkakuji in 1995. The second forum brought all three commissioned composers onto the stage, along with interpreter Sharon Nakazato and cellist Fred Sherry. Mr. Sugiyama and Mr. Kitazume discussed what it meant to be a Japanese musician composing in a Western idiom. They both seemed to think that the issue of nationality wasn’t particular important, especially since from the beginning their musical training was not in classical Japanese music, but in Western art music. 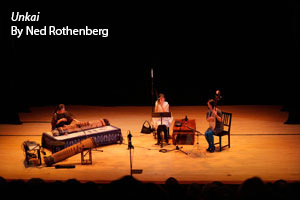 Rothenberg, who has had the very different experience of studying traditional Japanese music as an American (in addition to his studies in European and American music), summed up the general sentiment, explaining that musicians are a product of what they love, irrespective of nationality. It seems that in a time when international musical resources are so accessible, composers and performers can truly choose their own path, according to what interests them. Both New York performances were favorably reviewed in the February 10th edition of the New York Times. Check out the article by clicking here. 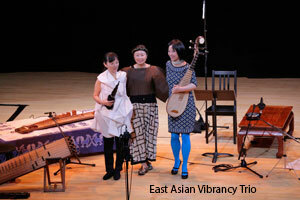 On February 10th, the East Asian Vibrancy trio performed at the Freer Gallery in Washington DC, where they performed to a hall filled to capacity. As the musicians were more familiar with Rothenberg’s Unkai, the performance of the piece was even more nuanced than the premiere in New York, and so the trio enjoyed a well-deserved standing ovation.